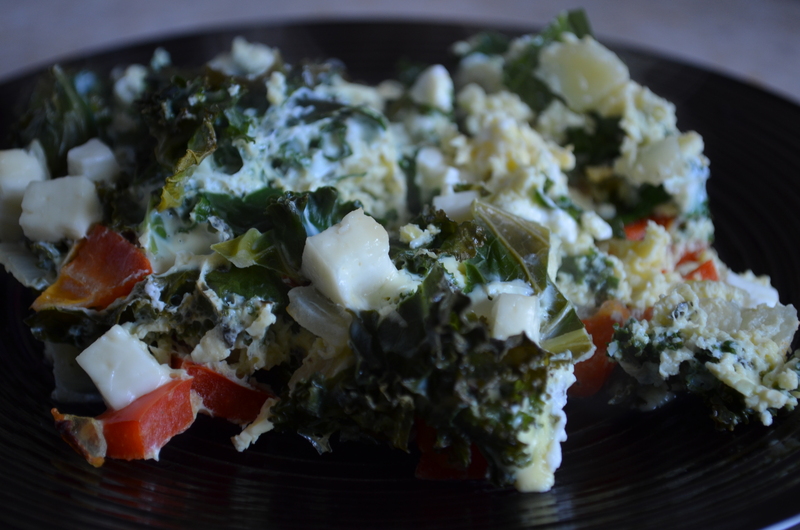 I made this frittata with onions, red peppers, and kale, sprinkled with fresh goat feta (my local grocer sells his feta at a fraction of the cost of the supermarkets, which is partly why it is featured in my cuisine so often!). 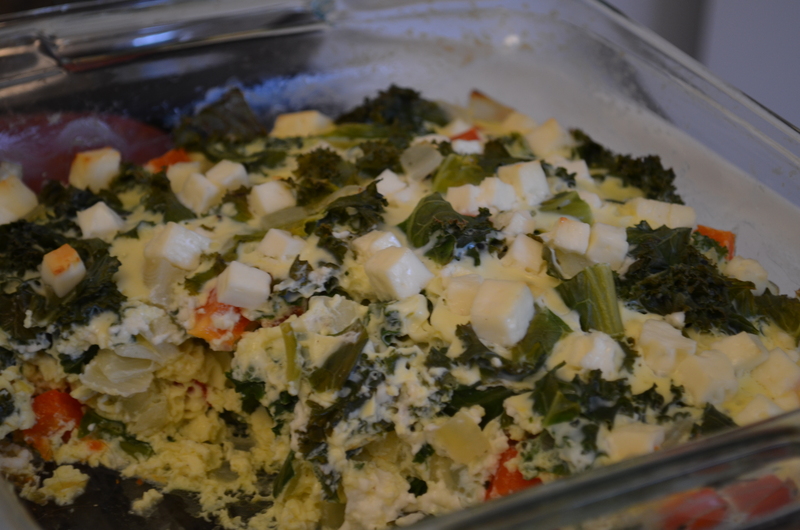 The textures of the vegetables go very nicely with one another and complement the eggs’ softness. The flavours are bold, but not overpowering. 1. Preheat your oven to 350º. 2. Heat a frying pan over medium heat with a small amount of olive oil in it. 3. Dice the onions and add to the hot frying pan. Cook the onions on medium-low heat for 5-10 minutes, until the onions are translucent but not too browned. Remove from heat. 4. Dice the red peppers and add to the onion mixture. Stir to combine the vegetables evenly. 5. Carefully wash the kale leaves and remove the large stems. Chop the leaves into small pieces. 6. In a large bowl, crack the eggs. Whisk in the milk, nutmeg, and salt and pepper to taste. Note: It is best to crack the eggs individually in a small bowl to inspect them before combining them all, to avoid using a bad egg. 7. Add the kale, onions, and red peppers to the egg mixture and mix until combined. You will most likely find that the kale takes up a lot of volume here, but it will reduce during the cooking process. 8. Transfer the eggs into an ovenproof dish (I used a square pyrex glass baking dish), sprinkle with cubed feta cheese, and cover with aluminum foil. Bake for 35 to 45 minutes until the eggs have set. If you wish to brown the top of the frittata (I recommend it! ), remove the foil for the final 5 to 10 minutes of baking. 9. Wait 5 minutes before cutting the frittata into squares. As you can see from my picture (above), I did not heed my own advice and ended up with an omelette-style serving. Either way, serve it piping hot with a side salad, soup, crusty fresh bread, or anything else you want! This entry was posted in Breakfast and Brunch, Eggs, Entrées, Vegetables, Vegetarian and tagged breakfast, brunch, eggs, feta, frittata, kale, quiche, red pepper, vegetables, vegetarian by laratboulos. Bookmark the permalink.